Free Worldwide Shipping & Tax-Free ? The epitome of a feminine and vibrant hue, pink sapphires offer stunning light reflection and a range of hues. A perfect clarity Ceylon pink radiant cut sapphire. Pink sapphires have been exponentially increasing in popularity as a modern and extremely flattering colored gemstone. The color pink exudes femininity and delicacy, coupled with an inner resilience and strength. 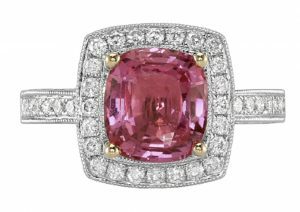 All the various shades of pink sapphires are also some of the most universally complementary to all skin tones. 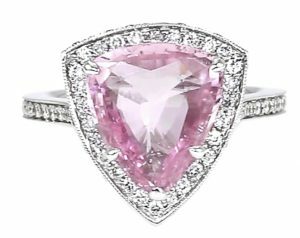 A most romantic stone, pink sapphires and pink sapphire engagement rings are set to have a massive year in 2019. 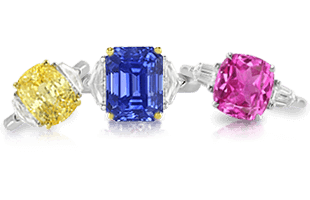 Colored gemstones are becoming more and more popular, especially as younger generations in the world of entertainment adopt their beauty in their own engagement rings. Lady Gaga, Jennifer Lopez, Victoria Beckham, and Blake Lively, to name a few, have all embraced colored gemstone engagement rings. 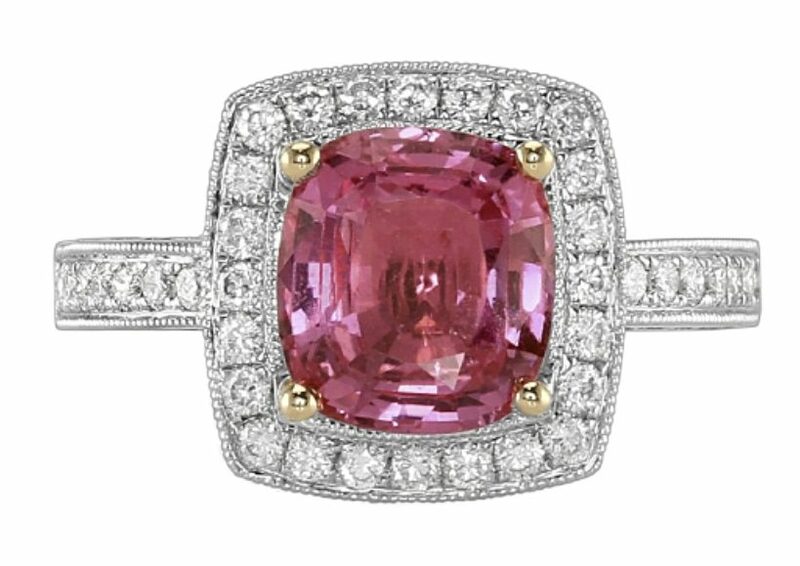 And pink has often been the color of choice, with pink sapphires and pink diamonds topping the list. Pink sapphires are recognized as having a variety of meanings, symbolizing good fortune, power through hardships, intense love and compassion, and subtle elegance. The vibrant color has become quite popular for engagement rings as many modern weddings trend towards blush and baby pink color schemes. A Ceylon pink cushion cut sapphire ring with pave-set diamonds. 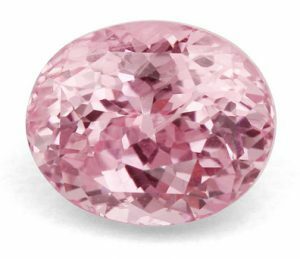 Pink sapphires are in high demand due to the extremely appealing color and the excellent light reflection inherent in these stones. 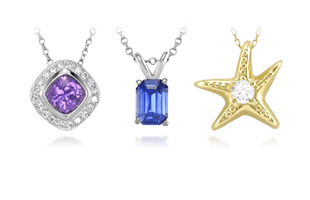 They have grown in demand to equal that of blue sapphires. 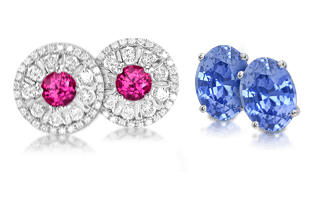 Even the various hues of pink sapphires are in equal demand, from light baby pink to “hot,”magenta, and intense. 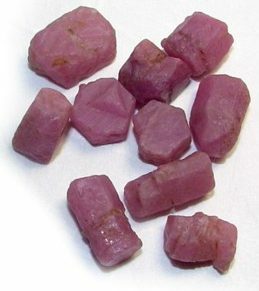 Examples of pink sapphire crystal rough. Pink sapphires come in very pale baby pink to vivid, intense magenta. In previous year’s markets, the most coveted pink sapphire colors were saturated purplish red hues with a medium tone—these are often described as “hot pink” or “bubble-gum pink.” As we head into 2019, pink sapphires are experiencing record popularity with the lighter tones of pink being widely embraced. These baby pink hues have a lighter, airy quality about them and allows them to pair so nicely with a rose gold metal. The “superior” tone of pink is highly personal in taste. A lighter pink should not be considered lower quality nor should an intense color necessarily be seen as a higher quality. Although more intense colors are more rare than lighter pink tones, and hence more expensive, they are not necessarily more desirable than the lighter baby pink hues. How Does Cut Affect The Color? A beautiful light pink oval cushion cut sapphire. 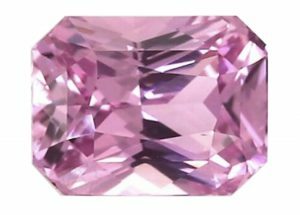 As mentioned above, cut is extremely important to your choice in a pink sapphire, especially when dealing with any stone over 1 carat. The cut allows light and color to shine through at their very best to enhance the beauty of the stone. Cut is of particular importance in lighter colored stones, as it is going to be the main factor affecting how your sapphire sparkles. If the cut is poor, the stone will look dull and lifeless. Skilled cutters will take all of this into consideration, as well as how inclusions appear in the stone, since inclusions will also be more apparent to the naked eye with lighter colored stones. What Is The Availability Of These Gems? A beautiful Ceylon pink cushion cut sapphire in a popular “hot pink” hue. Pink sapphires have become more widely available since new deposits were found in Madagascar in the late 1990s. 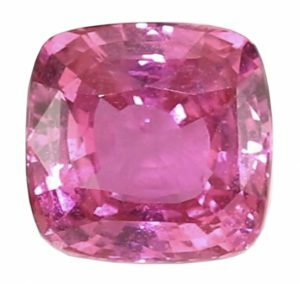 Until that time, pink sapphires were considered exceptionally rare since they were only found in a few locations around the world including Sri Lanka and Myanmar. Eye-clean, untreated stones are available on the market, but the majority of these have had their clarity enhanced by heat treatment . Because pink sapphires are rare, stones half a carat or more are not cut into calibrated sizes. Instead, each stone is cut to retain as much of the rough as possible, meaning that most are given a mixed cut. A unique trillion cut “baby” pink sapphire and diamond ring. Madagascar is truly the leader of pink sapphires today. The quantity and quality are unrivaled by any other source. Small sapphires under 1 carat size are common, with most crystals having good clarity and uniform color. This makes it easy to identify a classic color associated with most Madagascar sapphires. Most of these pink sapphires have a medium vibrant pink color with an almost electric light reflection property. Beyond Madagascar, pink sapphires are most often found in Sri Lanka, Myanmar and the mines of East Africa. Continue with us as we next explore the bright and cheery world of Yellow Sapphires. 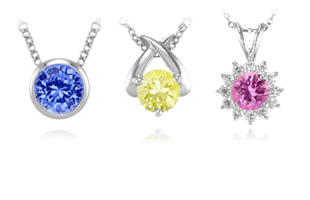 Why Choose The Natural Sapphire Company? Why Choose Us? How Do You Best Establish the Value of a Sapphire? Why Do Labs Not Agree On Sapphire Gradings? What Is The Color Of a Padparadscha Sapphire? Where Do The Best Sapphires Come From? How Do I Care For My Sapphire Jewelry?